What do YOU Think?? Leave me a comment and let me know! Share this with a Pin, Email, Facebook, Tweet and Share the LOVE!! 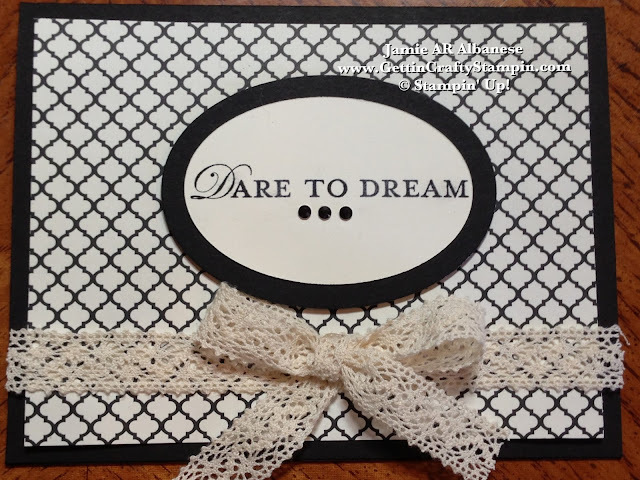 you can quickly create this elegant and stunning project. *See HOW to Earn ANY Item for 50% Off with our Awesome Hostess Benefits!! Earn BONUS Frequent Buyer Points as my customers, too!! JOIN ME with My Classes, the Gettin' Crafty Stampin' Mailing List and the Gettin' Crafty Stampin' Virtual Club!! When YOU Dare To Dream, the Possibilities are Endless!! Join me in this Black and White Challenge and see the fun fashion inspiration. Find a reason to celebrate, encourage and cheer when you send a card as lovely as this! Join ME! I look forward to seeing (and hearing from you) soon!